Back to school! Create lunchbox love notes with our personalized stationery. Shown here are two kinds of gift enclosures, Festive and Executive. It’s back to school time. Pencils, crayons, scissors and text books top the school supply list. But don’t forget the organizational tools you need to keep your kids on track and your own peace of mind in place. Highland Memo Square For the grade schooler, personalize this memo square with “A note from the mom of Zack Thompson.” Your child’s teacher will always be able to keep track of special requests, questions and special thank yous. Highland List For the high school or college student, personalize this list with his or her name. It will be easy to see the day’s or week’s tasks and home work. Family Organize By Day Slab puts the week’s sports schedule, playdates and dance recitals in a central place. The whole family can stay on track. 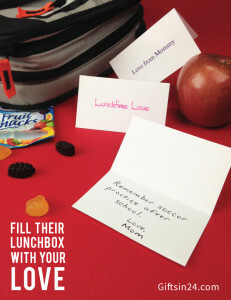 Highland Gift Enclosures make perfect lunch box notes, for you to tuck in an encouraging word, a sentiment of love or a quick reminder mid-day.